NASA’s Chandra X-ray Observatory explores the universe in X-rays, a high-energy form of light. By studying X-ray data and comparing them with observations in other types of light, scientists can develop a better understanding of objects likes stars and galaxies that generate temperatures of millions of degrees and produce X-rays. In this image, an expanding shell of debris called SNR 0519-69.0 is left behind after a massive star exploded in the Large Magellanic Cloud, a satellite galaxy to the Milky Way. 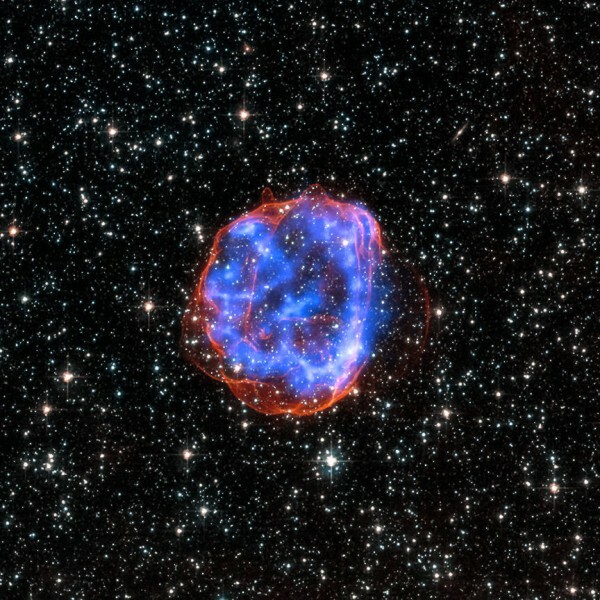 Multimillion degree gas is seen in X-rays from Chandra, in blue. The outer edge of the explosion (red) and stars in the field of view are seen in visible light from the Hubble Space Telescope.